So, you know the rub: Adult only children are spoiled, bossy, selfish, dependent, and grow up too damn fast. Well, it ain’t so. 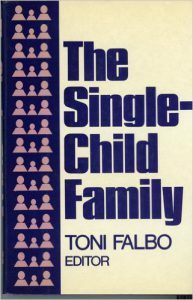 At least, that’s what leading sibling researchers like Toni Falbo, author of The Single-Child Family, have found. Excerpt From: Jane Mersky Leder. “The Sibling Connection: How Siblings Shape Our Lives.” iBooks. Now, I’m married to an only. My son is an only child as well. And I must admit: There have been many times when I’ve tried to rationalize some . . . well, rather unbecoming behavior . . . by blaming it all on the fact that they didn’t grow up with brothers and sisters and missed all of the sibling stuff that molds our characters and so many important decisions we make in our lives. I mean, why wouldn’t an adult only child be spoiled when she was the center of her parents’ undivided attention? Or, pray tell, wouldn’t an only child grow up to be a rather awkward adult herself without having benefited from those social skills we hone growing up with siblings? Toni Falbo, the above-mentioned author and professor of educational psychology in the College of Education and faculty research associate in the Population Research Center at the University of Texas, Austin, helped me set the record straight. After decades of research, Falbo concluded that only children were not markedly different from children with siblings. In fact, only children were slightly more verbal, were good students and were not the arrogant centers of the universe. So, though it’s unscientific to state absolutes about adult onlies, there are stereotypes that are, for most, unfounded myths. Myth: Only children are aggressive and bossy. Fact: Only children want to be included and well liked. They learn quickly that being aggressive and bossy pushes potential friends away. Myth: Only children are spoiled. Fact: Researchers have found that only children are not particularly spoiled and that there is no difference in only children’s relationships with friends when studied with children who have siblings. Myth: Only children are selfish. Fact: At one time or another, any child can be selfish and think of only himself/herself. Yet parents with one child help cultivate the tools of sharing and feeling for others and can be the best early teachers. Myth: Only children are dependent. Fact: Only children are often more independent and self-reliant than children with siblings because they don’t have siblings to depend on. Myth: Only children grow up too quickly. Fact: Children with siblings often talk to their siblings more than they talk to their parents. But the most important role model for only children are parents. The result is that only children copy adult behavior, speech patterns, and behavior. This often helps them handle the ups and downs of life more easily. Do you have anything to add to the conversation?